15 May, 2018 in comfort zone / daily practice / Health / podcast-episode / productivity / relationships / zen by Minette Riordan, Ph.D.
Whoo hoo! We made it to our 100th podcast episode! Now that is something to truly celebrate 🙂 We’d like to introduce you to one of the nine key areas that connects to your unique productivity style: environment. The key areas include: environment, energy, boundaries, support, goal setting, planning, systems, tasks, and focus. I think many of us creatives become entrepreneurs because we’ve struggled in more corporate settings – we’re done trying to fit into someone else’s box. I say it’s time to shred the box, put it in a recycle bin, and create something new and really unique to you! We’re hoping we’re going to help you do that over the next nine episodes. Today, we’ll be zero’ing in on environment: why environment matters, what do we mean by environment, and how you can make shifts in your environment to increase productivity according to your unique productivity style. If you remember, the creator is the most outwardly creative but also the most outwardly charismatic and extroverted. They thrive on conversation and on influencing others. When it comes to environment, they love stimulation. A co-working space could be a blessing and a curse. The contemplator likes a routine and peaceful, organized environment. With no conflict. Easily overstimulated by people, noise, or distractions. For contemplators who are working at home, you’re probably the most successful working home. You’re probably pretty committed. The conductor is a lover of harmony. Like the contemplator, they don’t love conflict, but they can easily adapt to people and surroundings. They’re actually pretty comfortable working in a co-working space. They can get a little lonely and isolated at home as well because they’re people people, and they love a collaborative environment. The commander works best with a dedicated office space with a door where they can go in there and they just shut the door, and they get the work done. Remember, they’re focused. They’re driving. It can probably build up and get pretty messy until they feel like it’s going to explode, and then they (if they’re a smart commander) ask for help in getting it cleared up. Do you know your creative Productivity Style? To learn more about each style, watch the full podcast. optimal environments for all 4 productivity styles (Creator, Contemplator, Conductor, and Commander)! Minette Riordan: Something else that we know to be true about ourselves and about creatives no two people work the same. No two people can follow the same path or the same blueprint or the same rules. Minette Riordan: Have you ever said to yourself, “I don’t have enough time”? Minette Riordan: I’m Minette. Not only have we said all these things ourselves, but we’ve heard our community of creative entrepreneurs say them over and over again. Brad Dobson: That’s why we created the “Structure and Flow” podcast. I’m structure. Minette Riordan: I’m flow, and this is the productivity podcast for creative Entrepreneurs. Brad Dobson: We believe that doing more na working harder are not the solution to your productivity challenges. Minette Riordan: We believe in more play, more fun, and more profit. Join us as we explore the interplay between structure and flow, so that we can bring more grace and ease to your creative business. Brad Dobson: Hi, and welcome to episode 100. Brad Dobson: Woo-hoo. I love it. I can’t believe we’ve got 100 episodes under our belt. Minette Riordan: Sorry for screaming in everybody’s ears. Brad Dobson: I’m sure they’ll love that in the car. People freaking out in the car. It’s hard to believe we have 100 episodes under our belt, and it’s been a great run. It continues to just be a blast I think. Minette Riordan: Yeah. Absolutely. If you’re wondering how there is 100 episodes, it’s because we were formally known as “The Path to Profit Podcast”. We recently re-branded, but we kept counting the episodes because we’ve come so far. One of the reasons we switched is because I think that running a podcast has taught us a lot about productivity. Brad Dobson: Oh, definitely. Also I think it speaks to what we teach our clients which is to focus on that niche. We had a wider scope, and now we’re downsizing that scope down nicheing. Minette Riordan: We’re narrowing the focus, and claiming our expertise really because I think that productivity is one of the essential things we teach at the pathtoprofitacademy.com. If you’re brand new to the podcast today, yes, we are always this silly but maybe always not quite so disorganized. This is episode 100 of Structure and Flow, and I’m Dr. Minette Riordan, your co-host along with … Dun-dah-dah-dun. Brad Dobson: I’m Brad Dobson. Minette Riordan: We’re here to have some fun but also to share with your something pretty new and exciting. Over the previous four episodes, we talked about our brand new unique productivity style quiz, and a lot of you have gone and taken that, so thank you for doing that, to learn about your productivity style. What do you do with all that information once you actually you learn it? How does it help you to improve productivity and to increase how much you’re getting done on a regular basis? Brad Dobson: Whether you’re a commander, a contemplator, a conductor, or a creator, which, once again you should have found out by taking that awesome quiz at pathtoprofitacademy.com/upsquiz which you heard in the last episode. Minette Riordan: What we want to introduce you today is part one of a nine part series that we’re calling “The Nine Pillars of Productivity.” As a creative, myself, and I would say that Brad in his way is creative although he loves structure more than I do, I have fallen in love with structure, and I’m actually pretty damn productive. I get a lot of stuff done. In fact, what I’m doing most days doesn’t feel like work to me either. I love what I do, and so we realized in our work with ourselves and in our work with our clients that there’s kind of nine key areas that also connect to your unique productivity style that we want to emphasize when it comes to creating a productivity blueprint that works for you because something else that we know to be true about ourselves and about creatives: no two people work the same. No two people can follow the same path or the same blueprint or the same rules. Minette Riordan: I think it’s why so many of us become entrepreneurs that are creative and have struggled in more corporate setting is because we’re trying to fit into someone else’s box. I say it’s time to shred the box and put it in a recycle bin and create something new and really unique to you. We’re hoping we’re going to help you do that over the next nine episodes. Brad Dobson: These nine pillars, we’re going to list them out here, but we’re going to do one episode for each. Minette Riordan: Otherwise it’d be really long, and you’d get really tired of listening to us. Brad Dobson: If that sounds like too much, it’s not. There’s just a whole bunch that you and we can learn about productivity as it relates to each of the different unique productivity styles. Let’s go through just real quick what the nine pillars are. Oh, you didn’t alphabetize them. Oh, no. My ADD is cutting in. Minette Riordan: But it’s pretty and colorful, and look … If you’re looking on YouTube, we have this awesome little chart that we’ve created here. No, they are not alphabetized, but I could do that for your honey. Brad Dobson: Well, I’ll go through them in the non-alphabetized version. Environment, energy, boundaries, support, goal setting, planning, systems, tasks, and focus. Minette Riordan: There actually is a flow here to each of these. No, it’s not alphabetical, but it’s the things that I think that you need to do first. If you imagine that you’re building a Lego brick house, you start with your foundation, with your floor. I think environment is one of the most foundational aspects of any great productivity plan. 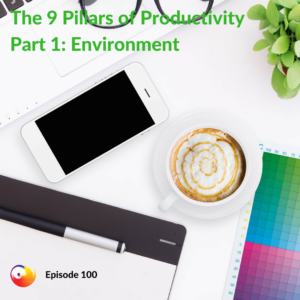 Today, we’re going to zero in on environment and why environment matter, what do we mean by environment, and how can you make shifts in your environment to increase productivity according to your unique productivity style. Minette Riordan: Can we talk about her more like we talk about her all the time? Brad Dobson: A current favorite of ours. Minette Riordan: Maybe if we talk about her enough she’ll come as a guest on our podcast. Brad Dobson: That would be cool. Minette Riordan: If you know Gretchen Rubin, will you introduce us? Brad Dobson: Yeah. Hook us up with that. Maybe she’s just like GretchenRubin@gmail.com or something. Minette Riordan: I’ll go stalk her on social media. Minette Riordan: Such a great quote. Brad Dobson: So true. So true. Minette Riordan: I love that quote. Brad Dobson: I am a big de-clutterer, but I’m not good at it. In other words, I really want it. I really want things to be clean and relatively empty, and they slowly build up, and then I don’t have good habits around de-cluttering. I’m not yet a member of the de-clutterati. Minette Riordan: I personally don’t mind clutter. I mind dirt, but I don’t mind clutter. Clutter usually leads to more dirt, right? It’s funny. We have spaces in our home that we tend to keep pretty clean, like our living room is neat and our bedroom is actually really neat most of the time as well. Minette Riordan: The kitchen is not just neat but clean. A cluttered counter or a kitchen sink full of dishes, like it is right now, can really make me crazy. I love what she said about it gives you an unexpected boost to your happiness. I found like I got up this morning, it was a fun weekend but we had a two-day retreat with our clients last week, so everything came home Friday night and just got dumped in my office. All the packing boxes from our retreat, all the art supplies. Not two days before that I had come home from an art retreat of my own that I had attending, which was amazing, and I had come home with a whole box of art supplies from that. All of the sudden every surface in my office, tabletops, floors, desks, were completely cluttered. Minette Riordan: Then I played in my craft room, office/studio all day yesterday, and did my homework for my creative depth coaching program. Half the art supplies came out of the boxes and the nice storage bins that they’re supposed to be in. I walked in there about at 6:00 this morning while the coffee was brewing, and I just spent 15 minutes neatening. It still needs a lot more neatening, but I find that when it gets too cluttered I can’t focus. There’s a fine line between what amount of clutter is comforting or actually creates creativity and what amount of clutter completely stops your creativity and your productivity. Brad Dobson: We could go down that rabbit hole. I think certainly if you have stuff that has been labeled as clutter for over six months, maybe you have a problem like we do. If it’s five years, seriously, throw that in the garbage can. Six weeks? Not so bad. You can give yourself a break on that. Minette Riordan: This would’ve been a really good episode to have our friend Rochelle Price on to talk about was to manage stuff in your office space. She’s so good at that. Brad Dobson: She’s a talent. Minette Riordan: We may have another one about environment with her. Brad Dobson: On from clutter, what about noise? Minette Riordan: Noise for me is way worse when stuff when it comes to clutter. I cannot focus when there is verbal clutter around me. I was never a student that worked well in a noisy classroom. I was never a student that liked working in libraries I was too easily distracted by people and by conversations. Brad and I tried sharing an office, and it’s annoying when one or the other of us is on the phone. I didn’t feel like I could be coaching clients. I [crosstalk 00:10:29] lots of vocal or verbal clutter. For me, audio clutter is a big one, but you have a different perspective. Brad Dobson: Yeah. For me, conversations are brutal because my head just wants to be in the conversation. I can happily listen to music with lyrics no problem. Ads, with talking ads, that’s a problem, but death metal? No problem. Listen to it all day. Rock out to it. It’s great. Or Jackson Brown or classical or punk. Just bring it. Minette Riordan: I can’t work to music unless it is lyric-free. Minette Riordan: I love words. I listen to the words. Brad Dobson: The conversation really, really gets me. I asked this question to our clients, and a number of them were quite clear they need ambient music. They want music. Getting back to something we mentioned in a previous podcast, I think we tend to use music and noise to cover the blank spaces that we don’t really want to deal with, which is the same as why we don’t want to meditate. We’re a little fearful of that. They were happy and wanted ambient, so there’s some really neat resources out there. There’s a couple websites that will give you either just rain or a Starbucks background constantly. Those types of things. Moby has a long ambient series that completely free. You can get it on Spotify I think or on YouTube. Just play that forever. Minette Riordan: We should link to some of those great resources in our show notes about where they can find some of those ambient. Brad Dobson: Yeah. I find it difficult to set myself up for failure by saying I have to have silence. The same is true with meditation. You’re a much more powerful meditator if you can handle different noise inputs when you’re meditating instead of having to have silence. If you can be a little bit more flexible about noise so that the neighbor’s dog barking for 10 minutes doesn’t just crater your whole. Minette Riordan: I want to back up a minute about this whole idea of environment and start with something actually a little bit simpler which is are you working at home? Most of you who are listening to this that are creative entrepreneurs may be working at home. You may be working in a cubicle space, or you may have a dedicated office, but I wanted to say something about working at home because this is something that has come up in quite a few of my coaching conversations over the last five years. This is about having a dedicated work space in your home. We are incredibly fortunate. We get it. We have a spacious house, so we each have offices. Mine doesn’t have a door, and it’s close to the kitchen. I love my space, and I don’t want to give it up, but I do get a little grumpy when I get some of that verbal clutter or audio clutter. I guess audio clutter if I’m coaching a client and Brad’s banging in the kitchen. He makes a lot of noise in the kitchen. Brad Dobson: No I don’t. Minette Riordan: You do, and so does Maggie. I realize that as we’re recording Maggie is going to be walking in the door any minute. If you hear a loud child shouting hello in the background, it’s our teenage daughter coming home from school. The thing about environment and having a dedicated work space, if your work space is your kitchen table, but your family also eats at the kitchen table, it impacts your productivity because every day you’re having to scoop stuff up, it gets stacked in a pile, you spend a lot of time the next day trying to find everything that you piled up to clear off the kitchen table or even just push to the side. I highly encourage you to find a corner of a room and even just get a small standup desk. I got one for 50 bucks on Amazon. A space in your bedroom or a corner of the dining room or living room that’s a dedicated workspace that’s your desk. Minette Riordan: I find that this breeds productivity when you can literally just sit down at your desk and get going, whether that’s in your journal with your calendar and with your computer, it’s so important. To me, it goes towards treating your business like a business and not treating your business like a hobby to a sort of boundary around this workspace. It also means when you have this boundary around your workspace, you get to walk away at the end of the day. Brad Dobson: What about folks that are doing more traditional art like say 30,000 pound bronze sculpture and computing work? Minette Riordan: They have studios. Brad Dobson: They just have a studio, and that’s there workspace on top of whatever their normal computer type of work is? Minette Riordan: Professional working artists that I know usually have a large studio, even if it’s just their garage. I have a friend here who is actually a bronze sculptor, and she does a lot of her work outside on her back porch. In the studio, there’s still a dedicated office space. There’s a desk where you’re still collecting paperwork, where your computer is, where you’re doing your work. I try really hard, I’m not always successful, at keeping my computer away from all the paint. It drives Brad crazy. Brad Dobson: She was walking around with splatter paint on her face today. Minette Riordan: It was splatter painting. Look. I washed my hands. It’s not on my hands and my fingernails anymore. There’s no spots on my glasses at the moment. Yes, even if you’re working in a creative design studio of some type, and that could be true whether you’re a graphic designer or a writer or an interior designer, having a dedicated office space where you put the paperwork and processes that are specifically related to running your business. There’s something really magical about doing time blocking to manage your environment where you say, “I’m going to spend an hour at my desk today doing business tasks” to run and operate your business. Brad Dobson: I was going to segue from the splatter painting to colors, but you raced ahead with something else. Let’s move on with colors. What can we do with colors in our workspace, in our environment, to help our productivity? Minette Riordan: Warm colors or cool colors can work, but it needs to be a color that you love. There are some people that say, “Yellow can lead to aggression.” They say, “You should never put yellow in a cafeteria because it’s bad for your digestion.” My office is bright sunny yellow, and I love it. Right? To me, it is a happy, beautiful color. Brad Dobson: I want gray. Minette Riordan: Although, at the moment you can’t see much of the wall. We’re in Brad’s office right now, and so we’re going to re-painting his a kind of a warm gray. Not a cool gray. It’s a gray with just a little bit of brown in it so that it feels really warm and not cold or sterile. Are you working in a space where you love the colors? If you don’t, you could repaint. If you can’t repaint, hang a drape. Get a room divider or just tack up a beautiful piece of fabric on the wall or hang some of your own art. I remember Brad and I one of the things that connected us when we first met is that we both love Van Gogh, and we both had cheap versions of Van Gogh’s “Starry Night” on the walls in our apartments when we were students. Even inexpensive art which you can get almost anywhere. Minette Riordan: We get more compliments in our house on a $100 painting that we bought at Ikea than a lot of other stuff. We bought it when we had a big, giant office in Texas when I had my publishing company and we needed some cheap art to fill the office. We bought this beautiful painting of pink cosmos, they’re gorgeous, and it wasn’t very expensive. It fills the wall space. Really look around and notice how do you feel in your space, because how you feel in your space directly impacts your energy. We’re going to talk a lot in the next pillar about energy and the importance of energy. Color, clutter, and dedicated workspace are three things to focus on in your environment. Minette Riordan: We’re standing up right now. Brad Dobson: Yeah, I really love it. It’s one of those things it takes two or three weeks for your feet and your back to be sore, and you can transition between sitting and standing, but gosh, what a great addition to my environment for blood flow. For everything. What do you think about that? Minette Riordan: I’m thinking about Gretchen Rubin again, because she shares a hilarious story about her sister who she convinced that she needed a treadmill desk. Brad Dobson: Oh, the treadmill desks. Yes. Minette Riordan: That’s an option as well. I have another friend who lives over in [inaudible 00:20:19] who posted a picture of her beautiful back porch with her treadmill desk and her gorgeous view of the mountains and the trees. A treadmill desk may be a good option for part of the time. I have a small standup desk that works some of the time. I like to sit. I spend way too much time sitting, but when I’m speaking or doing the recordings I actually prefer to stand. If I’m hosting a webinar, I prefer to stand. Brad’s right, it’s important that in terms of environment and what you have around you, you have something soft to stand on. I know you have one of those gym floor mats like you would like a kid’s play mat to stand on underneath the desk to add a little more support and cushion. Minette Riordan: My massage therapist and my chiropractor both talk a lot about your chair and how important it is to get the right chair if you’re sitting a lot and to get the right height. Some people love to sit on bouncy balls or the … I don’t know what they’re called. The ones where you’re basically sitting on your knees. Brad Dobson: I don’t know what those are called. Brad Dobson: Ergonomics is a big deal folks. Minette Riordan: Ergonomics is such a cool word as well. Brad Dobson: How do these … I got it in my mind I want to understand how some of these pillars relate to our different productivity styles. We went through different parts of your environment. The color and your sitting versus standing and the noise around you and maybe you like it hot or cold. All those different things that can affect your environment. We have different types of people, and they all process their world differently. Minette Riordan: They do. The one thing that’s in our notes that we didn’t touch on was co-working spaces. You may be someone who likes to the Starbucks environment with a little bit more organization. Rather than working at home, maybe you love working at a co-working space. That can work for some of the productivity styles and not so well for others, including those of us … I’m going to start in the reverse order here, and talk about the creator first. Minette Riordan: If you remember, the creator is the most outwardly creative but also the most outwardly charismatic and extroverted. They thrive on conversation and on influence of others. When it comes to environment, they love stimulation. A co-working space could be a blessing and a curse. They could actually get more done and find themselves being held more accountable by being in a co-working space where other people are working, but they could also spend more time in the kitchen making coffee and chatting with people than they could getting work done, because they love having the stimulation of other people around. The hardest part for a true creator is working home alone. It’s very isolating, so they might find themselves spending way too much time surfing on the internet and starting conversations on Facebook because it nurtures their need for stimulation. They have a hard time sitting still at a desk. They need to be up walking and moving. Walking and planning, taking your journal to the beach or a coffee shop, to do something planning outside of your office can actually be really, really healthy for the creator. Brad Dobson: They don’t prefer that structure quite as much. Minette Riordan: Nope. They don’t need it. In fact, they don’t thrive in a ton of structure. While they know they need planning, and they know they need structure, that structure needs to be loose and flexible in terms of their environment. Minette Riordan: I’m a great example. Before I moved into the office space that I’m in now, I bopped around the house. I might work in the living room or upstairs in my bedroom or in the guest room, formerly my craft room, or I’d bop in here with Brad for a while. Until I found my home space, you could find me all over the house. It wasn’t necessarily productive, because then there’s stuff all over the house. That kind of impacted the clutter, right? You want to about the contemplator? Because that’s you. Brad Dobson: Moving onto the contemplator. Yeah. Let me see what you’ve got here. Likes a routine and peaceful, organized environment. I think she’s got me nailed here folks. With no conflict. Yeah. No conflict. Easily overstimulated by people, noise, or distractions. Definitely. When I was at a co-working space, which I loved going to the co-working space … Shout-out to Impact Hub in Santa Barbara. Really need place, great people, but the way I wanted to work was with my headphones in and music loud so that I couldn’t hear anything else. I was basically a warm body at the co-working space. I wasn’t, like Minette said, the creator who’s off talking with everybody. Minette Riordan: You’ll love it even better when it’s gray, right? Brad Dobson: I can focus. Minette Riordan: Let’s talk about the conductor. The conductor is a lover of harmony. They like the contemplator. They don’t love conflict, but they can easily adapt to people and surroundings. They’re actually pretty comfortable working in a co-working space. They can get a little lonely and isolated at home as well because they’re people people, and they love a collaborative environment. They can get very isolated and pretty stuck when they’re working at home alone. They need to have people to talk to. The way they process, time and tasks, and the way they relate to getting things done and productivity is through collaboration and conversation. Minette Riordan: If you’re working from home in your environment, you might consider starting a small group mastermind. Just finding three to four friends or colleagues who are in a similar stage in their business who get to together once a week either in person or you could do it using Zoom or Skype’s a little bit harder. Zoom is our favorite tool for doing that. You could even do it over the telephone. You could do it with your smartphone. You could do a group connection call or free … Tele-something … Free … What’s it called? Free Conference Call is another great resource for doing this, but get together with other people for collaboration feedback, and input. This will help you be happier in your at home environment on an ongoing regular basis. Minette Riordan: That was the conductor. Brad Dobson: That was the conductor. The commander likes to dominate the environment around them. What does that mean? Minette Riordan: They’re very results-driven. They’re going to be pretty picky and fussy about how the furniture’s organized and where things are set up. They’re going to like things to be neat and orderly. They want other people to do it for them. They’re not necessarily that worried about doing it themselves, but they need a lot of autonomy in their environment. The commander works best with a dedicated office space with a door where they can go in there and they just shut the door, and they get the work done. Remember, they’re focused. They’re driving. It can probably build up and get pretty messy until they feel like it’s going to explode, and then they, if they’re a smart commander, they’ll ask for help in getting it cleared up. Minette Riordan: Remember commanders need team around them to help them be successful because they’re so focused on the big picture vision that they can lose track of some of the small day-to-day details of running their business. Remember, they’re in command. They’re in charge. When it comes to time, they’re bulldozers, and they need to remember to slow down, take a little time off to look at their daily calendar and do some planning to make sure they’re taking the right steps and surrounding themselves with the right people to be successful in their environment. Brad Dobson: Cool stuff. That was the commander, the contemplator, the conductor, and the creator as it relates to the environment. One of the nine pillars of productivity that we’re going through. Minette Riordan: It is. Environment, this one probably went a little longer on the recording than we anticipated, but it’s such an important topic. I think it truly is foundational. If you’re not happy in your work space, it’s going to impact your energy, which is pillar number two that we’ll be talking about on the next episode. Brad Dobson: That was a pro segue. Did you hear how she did that? Minette Riordan: That was a pro segue. That was really good, wasn’t it? Brad Dobson: Cool stuff. We have a couple of resources that we think you should take a look at related to this. Of course, Gretchen Rubin is pretty cool. Take a look at Stampington Magazines where women create. Stampington. Minette Riordan: Can I say a couple of words? I realize I put those resources in there, and then didn’t refer to them. Brad Dobson: Yeah. Of course. Minette Riordan: Let me just do that quickly. That’s why they’re in there, because I meant to mention them earlier. This is our disorganized environment apparently. Our talking environment today. Marie Kondo is super popular. “The Art of Tidying Up” is probably a book that you’ve heard of. Kondoing, her name, has actually become a verb. If you are an extreme member of the de-clutterati, you’ll love her book. If you’re not worried about clutter, don’t read it, because it might drive you crazy. I wanted to mention it because I think that she has some really great ideas about only touching things once, and only surrounding yourself with things that you really love. It makes it a lot easy to decide what to let go of in your space so that you can make space for your office and your work time and only keep the things that you love. It’s one of my big takeaways from your work. Minette Riordan: Then the other thing is I’m a huge fan of Stampington Magazines. They are publisher out of the Los Angeles area. They have some really beautiful very artsy magazines. One of their magazines is called “Where Women Create”. It’s all creative women entrepreneurs, not just artists but creatives of all kinds, who are making really cool stuff. They have pictures of their studios. I find it super inspiring because they are artists and creatives they have a lot of stuff. To see how other people are organizing their office and work spaces can be super inspiring if you’re feeling stuck. Also, you can just go on Pinterest or Instagram and look for artist studios or creative work spaces or tiny homes in the backyard. Brad Dobson: Maybe we shouldn’t lead them towards Pinterest on a productivity podcast. Minette Riordan: It is kind of a rabbit hole, but you know what? We went to Pinterest looking for ideas to set up our recording studio, which is one of your projects that we’re working on. This is great example of one of those things that’s going to increase and improve our own productivity is we literally mucked around for 30 minutes … Brad got us to set the microphones, and we usually batch record episodes so that usually helps. We only do it once, but then it took us like 15 minutes to get the sound on the microphones the way we wanted it. I had to do the lipstick and the powder. It would be nice to have a place, one that the background looks a little bit nicer than either one of our two offices, and two where all we have to do is go in and sit down and start recording and eliminate that initial fussy time of trying to set the systems up. Minette Riordan: I would invite you as you’re thinking about environment, what can you do to have your environment support your productivity instead of inhibit your productivity? My challenge to you is to make one change, just one simple change. That could be decluttering. It could be going and buying a new file folder. Just one thing that would instantly improve your environment and make you happier to be in that workspace. I would love to have you share that on the comments page for our show notes at pathtoprofitacademy.com/podcast and tell us what you’re going to do. Brad Dobson: Or take a picture of your workspace and let us know what your battle station looks like. Minette Riordan: That’s an awesome one. You can share that on your Path to Profit Academy Facebook page. We’d love to see some pictures. Brad Dobson: If you haven’t taken the quiz yet, once again like we said, it’s pathtoprofitacademy.com/UPSquiz. We’ll have that in the show notes. It’s a fun, quick, short thing, but you get your results in the e-mail. It tells you a lot about yourself, which that’s important. Minette Riordan: It’s really important, so have fun. We can’t wait to see what you create in your environment this week. Brad Dobson: Next up will be episode 101. We have a fun interview with Michael Prywes about creators and the law. Minette Riordan: The law specifically around copyright and intellectual property and things you should be thinking about as you are putting your creative genius out into the world. Minette Riordan: See you later. Have a great week. Brad Dobson: Thanks for listening to “Structure and Flow”, the productivity podcast for creative entrepreneurs. To find out more about this episode and others, go to pathtoprofitacademy.com and click on the podcast link.